How to import to Guinea? 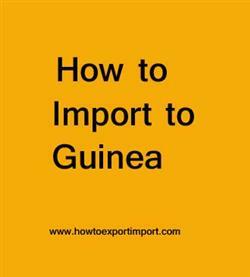 What are the import procedures in Guinea to move goods? Explain about import registration process, cargo movement to Guinea from overseas countries, Import delivery process in Guinea etc. Detail the import methodology in Guinea. This post explains about step by step procedures that need to be finished with Guinea government authority for importation to Guinea. Guinean Customs (Les douanes guineennes or Direction Générale des Douanes) is the authority responsible for levies taxes on goods efficiently, implementation of customs policies, facilitate legitimate trade and protection of the society and legal economic activities. This post explains about different phases in import process that every importer needs to go through in Guinea. How to import to Conakry? Formalities for import to Conakry. Procedures to import to Conakry. Need to import to Conakry. Explain to import to Conakry. Information to import to Conakry. Step by step process to import to Conakry. Methods to import to Conakry. Guidelines to import to Conakry. Please guide to import to Conakry. Help to import to. Procedures required to import to Conakry. Requirements to import to Conakry. Clarifications to import to Conakry. How can I import to Conakry. What should I do to import to Conakry.